Job Postings - Commend Me! Hello artists, I'm a comedian from the UK looking for an artist to draw me a poster for my latest show. I'd like the aesthetic of a North Korean propaganda poster like these ones: i.pinimg.com/originals/8b/5a/9… i.pinimg.com/736x/db/7f/62/db7… but with me as the Korean dudes, I've got some ideas for small funny details. Ideally you'll be able to do all the lettering for me and include that in the image, if possible I'd like to have versions of the image I can use for web headers and profile images. These things are totally negotiable if you're a sick enough artist. There's also a little picture I'd like drawing for the back of the flyer but I'll give the full boring details to the artist I go with. Looking for an artist I can collab with, you're the art maker, I'm happy to listen to your instinct and I'll give you as much creative freedom as I can, I'd like you to enjoy making this. Please reply with rough prices (happy to accept DMs), I want to pay a fair rate to a fellow artist but I'm also broke so bear that in mind when you quote (although I paid the last guy I hired off here more than he asked for because it was too cheap because I'm a great guy ;) ) also samples of your work/links to portfolio thanks. I can offer no exposure, I hope money and credit is OK instead. Gonna need the project finishing before April 6th. Let me know if there's any more info you need. Thanks! Need someone to make dungeon maps for my DnD adventures. I need someone to help me draw dungeon maps for my roll20 campaign. Budget is negotiable, based on how many maps you're willing to make, how big they are, etc. Board game board, already designed, need drawn. e're looking for an artist to bring our board game design to life. We have a digital layout of where everything is going to go, and have all the tiles laid out. Going top left and clockwise, there are 6 sections to the board. We have a graveyard, a church, a library, a school, the woods, and the cornfield. In each corner there is a zone, and there is a carnival, an asylum, a motel and a campground. Each of the 6 sections will have their own color theme, so basically the area needs to be shaded that color, as it corresponds with the character color. In the center is the theater, the one on the box art. This all takes place in a town. The right side of the board (church, library, school) are inside the town, and the left (graveyard, woods, cornfield) are outside the town. Inside the town, we thought the spaces could be just sidewalk pieces, and outside we had stumps, holes in the ground and gravestones. We're open to changes for the spaces, as long as it looks cohesive. There are four paths going to the center, coming from each corner zone, and 7 spaces for each section. The corner zones would be at the corners of the board, as outside the rest of the sections as possible. For look, we want a style similar to the box art, because we want to make it as cohesive a style as possible. We're going for a top down, but with a bit of an isometric lean on the buildings so we know what each one is. If you're interested, we can get into contact, take a look at your portfolio, share our concept art and talk out more details! I have a design for a hoodie for the OTR2 tour and I’m looking for a Dope artist to bring my idea to life on my hoodie? Yes I plan on paying And will send photos of what I sketched out that I want. Done before September 5th. Looking for voice actors of all shapes and sizes for a 2D movie. You will only be paid once the voice recordings have been reviewed by me. Looking for any race, gender, age, and experience. Looking for someone skilled in animation who can make a 2D movie about 30 minuets to 60 minuets long. I have the plot, characters, and storyboard ready, I just need someone to bring it to life! I’ve written a children’s book called the Paisley Scarf, that will be published. I’m looking for an artist who can draw a cover and multiple drawings. Please contact me about what you need to draw, and to discuss pay. You will be given recognition on the cover, back, description, and inside of the book however you wish, weather you want to display your contact information to find more jobs, or just display your name. You can also have a photo inserted if you wish, along with a blurb about yourself. Hello :) this might be a bit complicated as I need a physical metal/wood (W2ftH3ft) sign with my fathers two motorcycles and himself in between them in a cartoon style with the words " Gifford's Garage" written above the artwork, all before June 17. I will provide photos of the motorcycles and my father for reference. Thank you to anyone interested in helping! Looking to make art for a playmat (just the art, not the actual mat). I have the basic rough design but need help with the final design. Semi realistic. Would prefer to get in contact with artist and talk about the piece before anything else. Looking for a anime artist to draw a picture of me and my tabletop gaming group. I'd like it to be heavily stylized and maybe even a little over the top. There would be 4 people to draw + background. Budget is about $200 but we can discuss that. We're amateur game dev studio looking for some monster/enemy models for our upcoming game. Some of the monsters have concept art, some are just ideas so we might have some input during the creation of these models. We will of course need the source files. Some of these monsters will be slight variants of their original model. This will be 7 original and 5 variants. Need colorist for ongoing comic book series. This is 10 pages that need coloring. You'll be credited as well. I'm looking for a children's book illustrator for a picture book about a little girl and her cats. This will be 5-7 pages long, full color. Hi, I'm looking for someone to do a pencil/graphite style portrait in this style: https://www.instagram.com/p/-36ZDOQzRX/?taken-by=julianrentzsch https://www.instagram.com/p/-hgqwSwzQj/?taken-by=julianrentzsch https://www.instagram.com/p/BL3BeidA9w7/?taken-by=julianrentzsch I'm putting together a set of educational posters and I'd like to have these portraits done of influential people such as Einstein, Martin Luther King Jr. etc. I would like to start off with one and then possibly do a set of 4-6. I want to use different elements about them that make up the art or things that they are known for just like the examples. I would need all the rights to the final illustration. I'd like to have it completed in about 6 weeks in a digital format. I'm looking to hire a concept artist for a game my friends and I are working on. This game is fairly casual and lighthearted, so we want an art style that reflects that. Think nintendo characters. This job would include roughly 10 character concept and a few world art concepts. Hi there, my band The Dirty Fix has just finished recording an album and we are looking to have an album cover designed for it. Conceptually what we have in mind is an album cover with a portuguese man o'war (which is kind of like a weird type of jellyfish) on the cover, with it's tentacles kind of sprawling out and flowing across the front. The colour scheme for this cover should be consisting of blues/black/ some white and maybe a little green, specifically blue and black and a little white for the background, which can be a bubbling and splashing/chaotic kind of style . Our band name The Dirty Fix as well as the album name Chaos Rising should also be on the cover. The cover overall should have beauty in it as well as menace. The portuguese man o'war should be visible on the cover but not necessarily drawing to much away from the text. We had an artist begin to work on a cover but she didn't get very far, included is a sample of what she worked on (the picture with the text The Dirty Fix in it). The text of 'The Dirty Fix' and 'Chaos rising' in the picture provided is not necessarily how we want the font style or placement, just merely a place holder. Thank you, we look very forward to finding an artist interested in working this project. Our township has overcrowded elementary schools. Rather than build a new school to relieve the pressure / reduce stress on students and neighborhoods, our school board wants expand existing (and inefficient) school buildings. Basically, the kids in our township need room to learn! Parents/residents are planning a protest at the next school board meeting. I am looking for a black and white illustration for a flyer that encourages parents/residents to attend. Would Like a Gaming Team Logo! Hello artists of Commend Me! My name is Onyx and I have recently formed a League of Legends club called “LunaLight Spirits”. It’s in infancy right now but I’m looking for something a little extra, something that stands out amongst other team logos. So, this club was formed by me and a friend. He likes the idea of a logo and I am the one taking action to try and get a logo made so that we can use it for Discord chat rooms and potential avatars for Twitch and the like. Overall, I am not very picky, all that I’d ask for is something more than the Initials and name of the team as well as a few elements. 1: The Moon And/or Moonlight must be prominent. 2: The logo have both feminine and masculine aspects. Cause we have girls in the club. 3. Artistic, unique design. Something that I can’t throw together with a Font Generator. 4: Enough space for a player name ranging between 6 and 17 characters. 5: If possible, a 1920px width and a 1080px height resolution. I’ll gladly discuss budget (I can afford more than $10, that’s just a placeholder. )and ideas with anyone who is interested. Thank you! I am looking to see one image converted into the design aesthetic of another game, to fit within the approximate dimensions of a second image pulled directly from the game in order to allow basic animations. 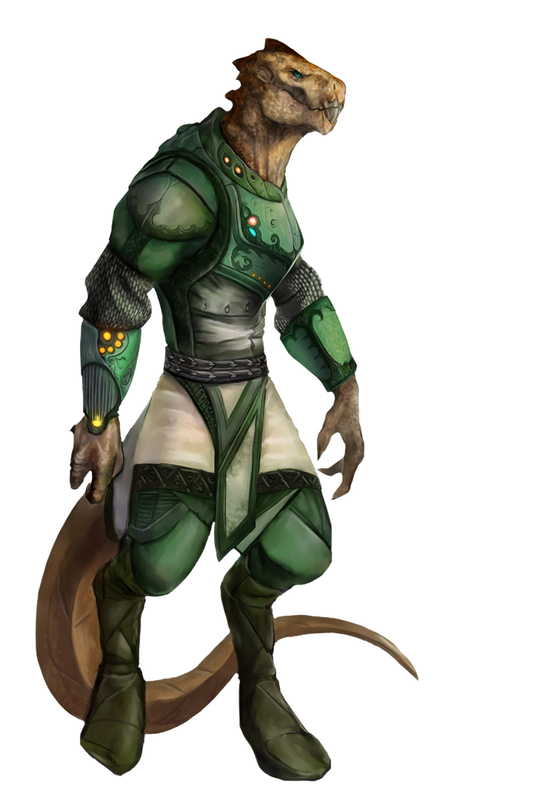 First image was commissioned about a year ago and is relatively lower resolution compared to the images in the actual game. Actual game images are broken up into portions (eyes, mouth, ears if present) that are animated via Maya, however all that is required is to create the base image, I can handle the remaining conversion. 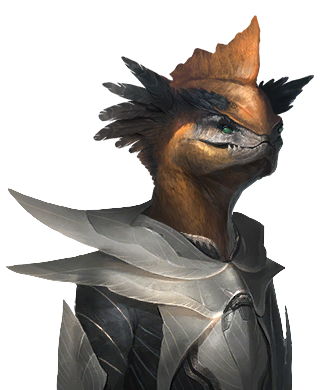 This image is the basic template from Stellaris https://stellaris.paradoxwikis.com/images/5/50/Avian_normal_09.png. The image hopefully created will simply go on top of this one, fooling the game into animating it. This second image https://cdn.discordapp.com/attachments/409110937128271890/412789072667475968/Haleel-stand-alone_A.png is what I would like to have converted. 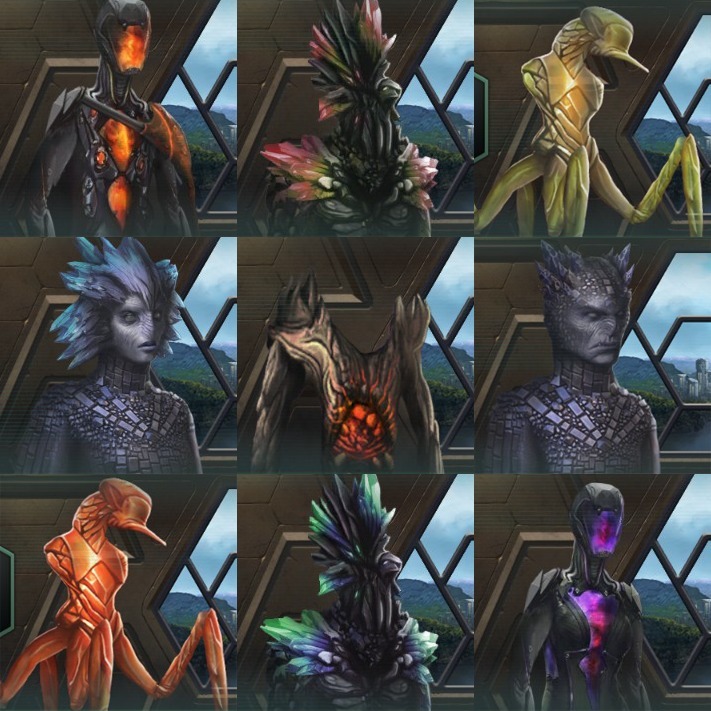 All of the portraits in Stellaris are upper body only and cut off at the waist. For further examples of portraits, please see the following. 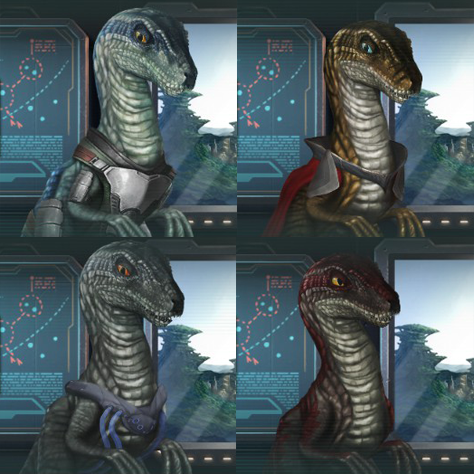 https://www.odingaming.com/wp-content/uploads/2017/10/animated-silicoid-portraits.jpg and https://odingaming.files.wordpress.com/2017/03/raptors.png. Both are using the template principle of simply placing the new image on top of a preexisting species portrait, thus allowing the animations to carry over. Please let me know what other information would prove useful in this. I know this is a bit confusing, and I can help clarify.